A personal response to the photographs of Abu Ghraib, the deluge of images and (mis)information thrown up by our military (mis)adventures in the Muslim world, and the idea of patterns of history. 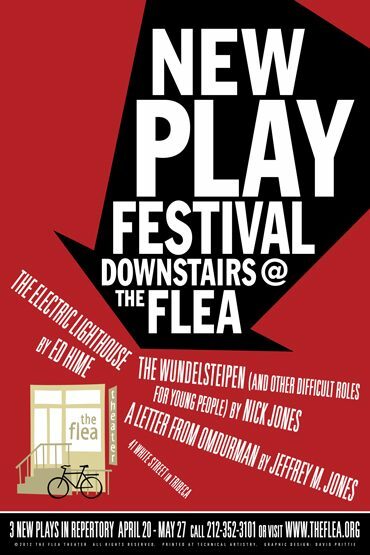 As part of the NEW PLAY FESTIVAL, The Flea Theater is proud to present the world premiere of A LETTER FROM OMDURMAN by Jeffrey M. Jones and directed by Page Burkholder. A LETTER FROM OMDURMAN is an assemblage of stories—some true, some invented—which interweave three historical periods: contemporary America; the events leading up to the gunfight at the OK Corral (Tombstone, AZ), and the Anglo-Sudanese war which ended in the defeat of the Mahdi Army at the Battle of Omdurman (1898), described by Winston S. Churchill in his memoir, The River War. The play is a dream weave of voices and stories: mythic history, where Lynndie England and Charlie Grainer walk out of Abu Ghraib right into the OK Corral, while Wyatt Earp, with a couple of gunships and young lieutenant in the 21st Lancers named Winston Churchill, track the hidden prophet known as the Mahdi, till the trail turns cold at sunset, at the Pier House in Key West. All true, mostly factual, just didn’t necessarily happen. The production features members of the Flea’s acclaimed resident acting ensemble, The Bats: Matt Barbot, Veracity Butcher, Eric Folks, Danny Rivera, Will Turner, and Wilton Yeung. The design team includes Kate Foster (Set), Jonathan Cottle (Lights), Colin Whitely (Sound), Whitney Locher (Costumes), and JuLondre Brown (Stage Manager). Jeffrey M. Jones is a playwright whose works include 70 Scenes of Halloween, Nightcoil, Der Inka Von Peru, Tomorrowland, a series of Crazy Plays, Write If You Get Work, J.P. Morgan Saves The Nation, a musical with a score by the late Jonathan Larson, directed by Jean Randich, Stone Monkey Banished, commissioned by the Mettawee River Theater Company, and A Man’s Best Friend, produced by the Undermain Theatre in New York and Dallas. His essays have appeared in The American Theatre Reader, Performing Arts Journal, and as introductions to the anthologies Plays by Young Jean Lee and New Downtown Now. He has been manager of The Wooster Group, Richard Foreman and John Jesurun; taught playwriting at the Yale School of Drama and a series of Pataphysics workshops at the Flea Theater; and is currently co-curator of the OBIE-winning Little Theatre series at Dixon Place. Page Burkholder is honored to be working at the Flea and with the Bats. In New York, she has directed plays by Mac Wellman, Mary Gallagher, Sherry Kramer, Athol Fugard, Joan Shenkar, Jeffrey Jones and Camila Jones and also worked for the Public Theater, the Women’s Project, Theater for the New City, Julliard, Clubbed Thumb, White Bird Productions, the Ohio Theater and New Dramatists. She was a long time member of the Invisible Theater in Tucson, Arizona, and started their Shakespeare Under the Stars festival. The Bats are the resident acting company members of The Flea Theater. Each year over a thousand actors audition for a place in this unique company. The Bats perform in extended runs of challenging classic and new plays. The Bats have recently appeared in World Premieres by A.R. Gurney, Will Eno, Adam Rapp, Beau Willimon, Mac Wellman, Elizabeth Swados, Thomas Bradshaw, Itamar Moses, Sheila Callaghan, Julian Sheppard, Ken Urban, Tommy Smith, Jonathan Reynolds, Trista Baldwin, Laurel Haines, Qui Nguyen, and Sean Graney.